West Coast Motors have been on the island since 2013 and have increased the options for this form of travel. 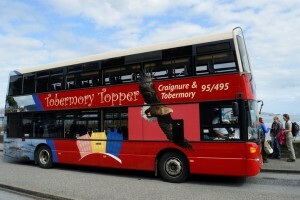 On the image to the left, is their double decker ‘Tobermory Topper’, but a ‘normal bus service also operates. 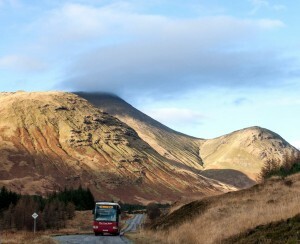 If you are traveling from Oban, a package of excursions can be organised. The Discovery Day Pass offers passengers unlimited travel on West Coast Motors bus services, including the Tobermory Topper, for one or more consecutive days so that they can explore Mull independently. Maximise your time on Mull and use your Discovery Day Pass to explore the island’s natural beauty. The bus is really the eco way to travel around the island, and it allows you to concentrate on the beauty of the island and not the driving.